It definitely still looks nice, but then when you step back and look at the bigger picture, I feel like it gets kind of lost. Before I get into my ideas, here is a listing photo from when we bought the house. We’ve come a long way! I put together some images of our space with different lights to see how they look. I usually do stuff like this just for my own personal use (and to try and persuade my husband that we actually DO need new stuff!!) but I decided to make a post around this so you can see what my thought process is! I used both of the photos above to create these images, so you can see how it looks close up, as well as how it looks with the living room decor. They’re all from Wayfair except for one that I threw in for fun from Anthropologie. 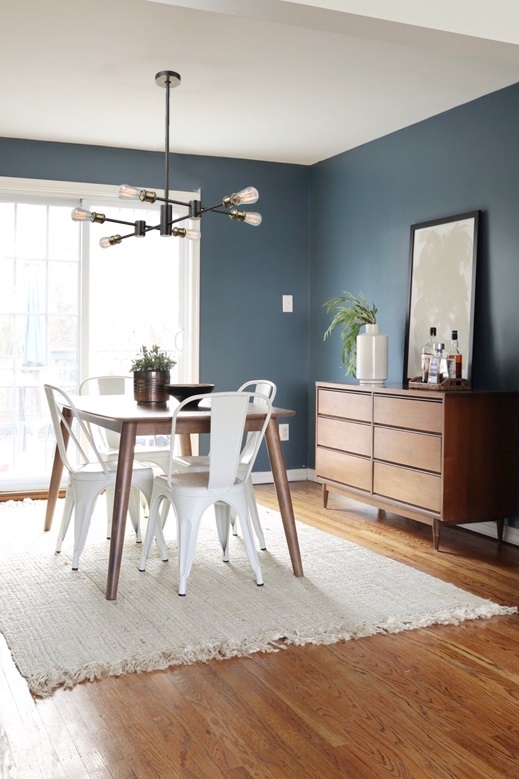 This is the only boho style light that I chose and I kind of love how it softens up the mid-century table and dresser. I also love how it looks with the shag rug in our living room. This one is probably my top contender! The rest of the fixtures are all sputnik style lights (except for the one from Anthropologie)! This one only has 4 lights, which I think is great for someone who likes the idea of sputnik lights but isn’t sure about diving right in with a big one. Here is a more traditional style sputnik light, with 6 lights. I like how the brass looks against the dark blue walls but I’m concerned it might be too much going on for the size of our room. The photo of this one has edison bulbs, but I would probably use round ones instead. The edison bulbs give it too much of an industrial vibe for me. I like how the black helps to kind of make it blend a little more, so it doesn’t feel as busy. I also have a lot of black accents in our living room that it ties into. Andddd just for fun- this light from Anthro! Totally out of my price range but I love how the shape is more like a classic chandelier, but then the unexpected use of wood really makes it stand out! This would definitely be an awesome statement light to have! So there are all my ideas so far! It’ll probably be a while before we actually replace it, but I’m always brainstorming! Let me know which one you like the best (just please don’t let it be the Anthro one)!! **Please note that this post contains affiliate links, which means I might make a small commission off your purchase at no extra cost to you.